The management of change in the office is made easier by furniture that is simple to understand, with minimal components. 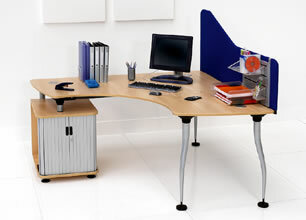 With a unique elegant shaped leg and worktops where all linking edges have a common radius, desks can be nested together like a very simple jigsaw. With comfort, health and safety always in mind every desk can be adjusted in height, every corner is rounded, the furniture is structurally strong but light in weight with semi-transparent screens to provide privacy and allow natural light to reach the work area. Crossagalla Industrial Estate, Ballysimon Road, Limerick, Ireland.